Orphan drugs are designated for diagnosis and prevention of treatment of rare diseases. US FDA designates as an orphan drug if the development cost is hard to collect from sale even though the number of patients with the particular disease in the US is more than 200,000, or if the existing drugs show indications of possible treatment of some rare disease. 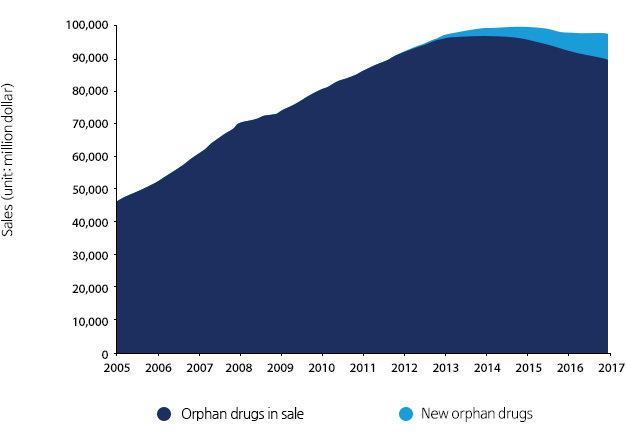 It is expected that the global orphan drug market will expand to $97.9 billion in 2017 with the annual growth by 2.1% from $86.3 billion in 2011. After the Orphan Drug Act (ODA) law came into effect in 1983, there were 104 types of orphan drugs developed in 2005~2011 with an annual growth by 9.6%.